Readings should be recorded to two decimal places, ending in 0 or 5. The titre is the volume added (the difference between the final and starting volumes). Select at least two concordant titres (these are titres within 0.10 ml of each other) and work out an average titre. Use this volume of acid to work out its concentration. A student has to check if two samples of hydrochloric acid, A and B, are the same concentration. Describe how the student could use the apparatus (burette, pipette, conical flask, white tile) and the solutions (indicator, HCl A, HCl B, NaOH solution) to carry out titrations. Use a pipette to measure the acid into a conical flask, then add alkali from the burette. Add hydrochloric acid, using a pipette, into a conical flask. Fill a burette with the sodium hydroxide solution, then add a few drops of indicator into the conical flask. Slowly add the alkali to the flask and swirl the flask whilst looking for a colour change. 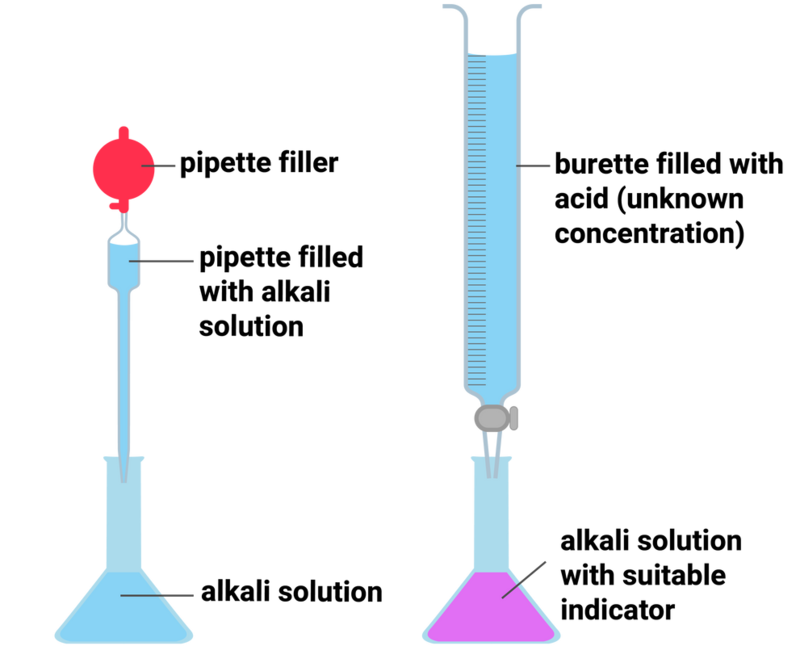 Once a sudden colour change has occurred, stop adding alkali, and record the volume of alkali added from the burette. Ensure you are wearing safety goggles and measure 25 ml of hydrochloric acid A, using a pipette and pipette filler, into a conical flask. Fill a burette safely with the sodium hydroxide solution, then add a few drops of indicator into the conical flask. Slowly add the alkali, drop by drop, to the conical flask and swirl the flask whilst looking for a colour change. Using a white tile under the flask can help to see this. Repeat this again for the hydrochloric acid B - and if the same volume of alkali neutralises the acids, the two acids are of the same concentration.